It's SEPTEMBER! Which means we have just "officially" entered the Christmas season here in the Philippines! As we know, the Christmas celebration in the country is reputedly the longest in the world. Come the first day of September, (when the “ber” months of the calendar starts), some radio stations begin playing Christmas carols and this goes on until Valentines Day. It really is a long stretch! So as early as now, we can start planning our shopping, beginning with the most popular Christmas shopping place: DIVISORIA! And don't blink because Divisoria is now being turned into an international shopping hub by the mayor of the city of Manila. 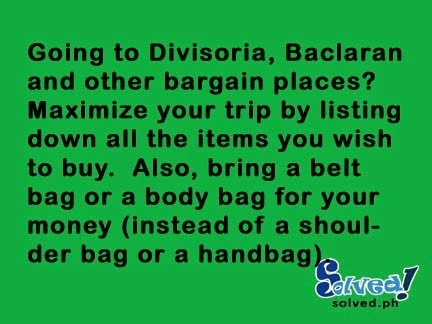 Can you share some tips on bargain shopping?